Today I set live a whole new version of my company Credo. While I’ve been iterating on the original idea of generating leads for marketing consultants and agencies for a while, and done it well (I’ve sent over $500k of work to pros on Credo), the time has come for phase 2. I’m excited to be here and absolutely terrified by it as well. 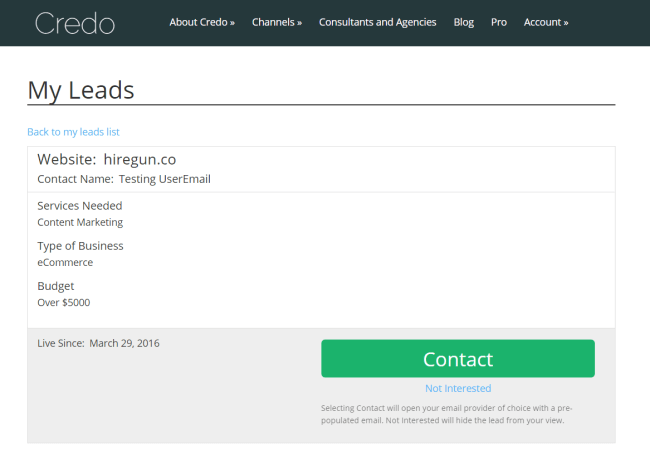 As of today, Credo isn’t a lead generation business. It is truly a marketplace, and the first of its kind, where you can find the best marketing consultants and agencies and contact them, for free. Not much has changed for businesses looking for growth. You can either contact a pro directly through their profile, in which case you will hear back from them directly. 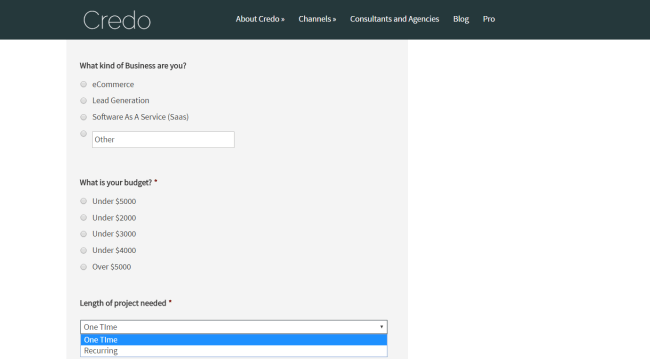 Or you can submit a request for proposals and get up to 3 responses from pros, often within 24 hours. Ok that part has changed, because previously pros couldn’t opt in to these leads. So big win for you there. 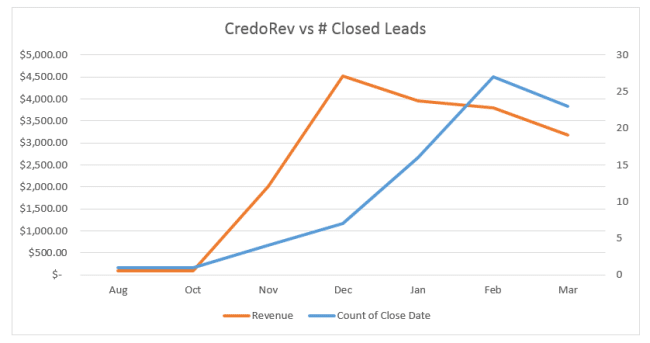 Credo is no longer a lead generation model. 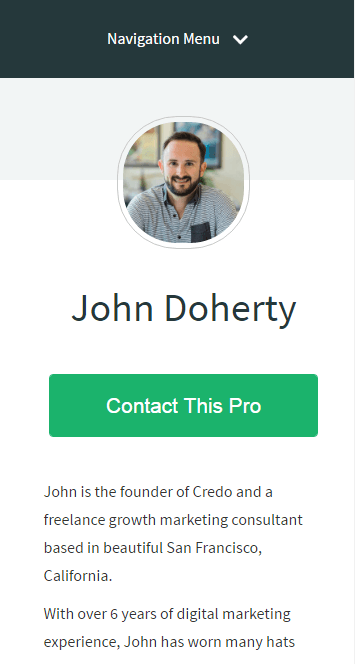 Rather, Credo is a SaaS (software as a service) platform that exists to help consultants sign more and better business through high quality leads (some businesses have made over $100k by being on Credo) and education. Here is all that is new in this version. 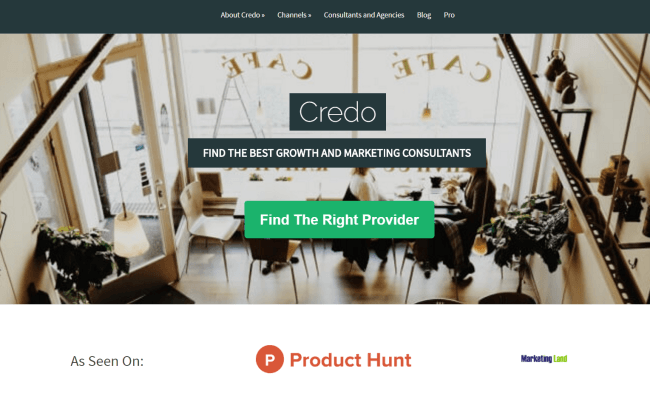 Credo has always been free for businesses to find the best digital marketing providers available online, and that’s not changing. However, what is changing is how pros get onto the platform and what being on the platform means. I have to be honest — this is scary for me and not something I’m taking lightly. However, I’ve realized that this business provides huge value for agencies, with some making over $100k in the past six months from Credo referrals. The average pro has made $5k from Credo referrals. 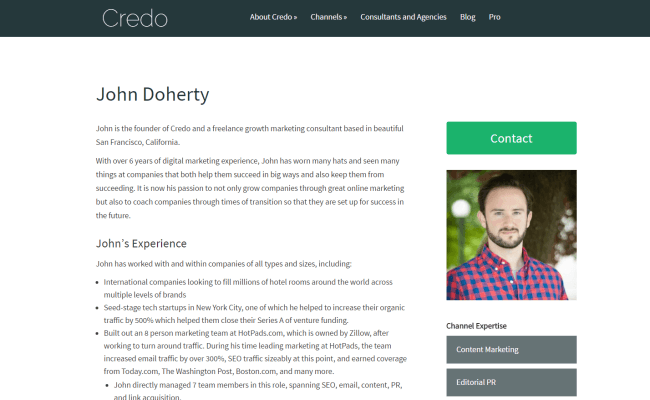 So today I am announcing Credo Pro, where any digital marketing pros (agencies, consultants, and freelancers) can apply to join Credo as a pro. This new model allows for a more scalable company and revenue stream while also bringing more value to more businesses on the platform as there is now transparency into open leads that anyone qualified with that level of access can claim. Payments are handled through Stripe and automatically billed each month. 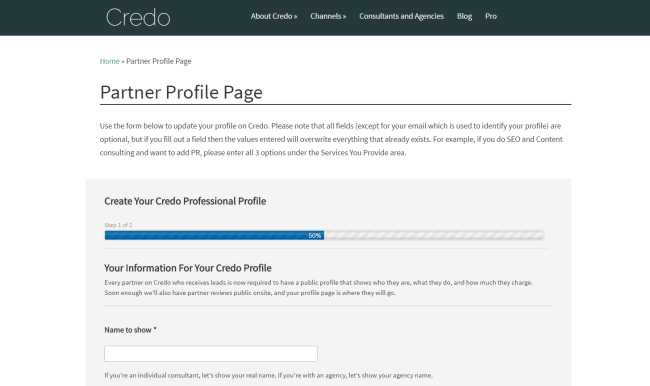 One of the things many of the early pros on Credo have asked for is a place to view all of the leads that they have received through the platform. Part of the launch today is a new way for pros who belong to the platform to view all of their own leads, and more than that, if they are a Consultant or Agency level member, they can also view all of the leads that have come in that did not go to a specific pro. If they are interested, they can then contact that lead directly. This feature is powered by GravityView.co. Since the beginning of this business, it has been invite only. I firmly believe in the Lean Startup methodology and doing things that don’t scale, so for a long time I was inviting pros who I knew did good work. I also only invited them when I needed their specific services. The downside to this is slower growth on the supply side of the marketplace. I also didn’t have the systems in place to allow pros to edit their own profiles and submit them for review. Every pro still goes through a review process, but they can now create their own profile and change it as they see fit once they are approved. You will see a theme here on out, but I’ve done a lot of work on the front end of the site. One of the biggest ones was the previously sitewide header image across the site. While it was a step forward from the default image, it was sub optimal and I hated seeing it every time I went to a profile page on desktop or mobile. As an online marketer, I never really took design seriously in the past. I’ve always preferred to ship and iterate to better. As I get deeper into building a product, however, I am starting to see how amazing good design can be for users as well as the business. Retention, conversion, all of that are made better by great design. The old version of the profile page was bare-bones. It had the information needed for businesses to make decisions, but it did nothing to build trust. For this new version, we wanted to bring the pro’s profile photo above the fold so that they can instantly build trust with potential businesses. The call to action above the fold should be good for conversion as well. Generally, this is the most important page on the site for businesses looking to find a pro. The better this page can be and more information it can provide, the easier it will be for businesses to find the right pro. 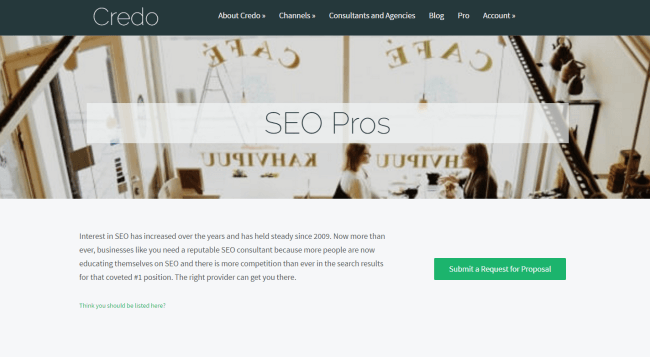 Because I’m a digital marketer at heart with a background in SEO, I’ve long known I was hurting myself on Credo by not having pages that automatically created based on the skills that pros told me they have. As I mentioned above, I’ve never really prioritized design. I was trained as an engineer and for the last number of years I’ve been focused on the more technical side of marketing and product. For the longest time, I had never really worked with designers either. On a phone call with a friend a month or so ago, this friend (a woman) said to me “It’s pretty obvious this site was created by a man”. Ouch, but oh so true. Taking that feedback into account I am starting to value design more and more. 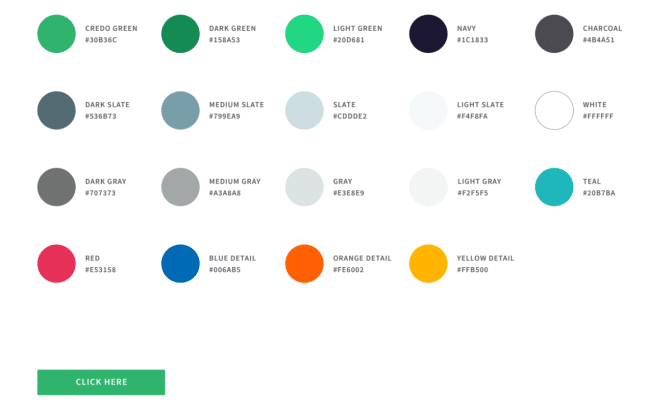 My wife Courtney is a designer and has done an amazing job on Credo, giving it better interactions and actually implementing a visual style guide that, quite simply, makes Credo more professional. One of the biggest changes you don’t see on the front end but makes life so much easier for everyone involved is the way that contact forms are architected. On the old version of Credo, I had a form dedicated to each pro. This was completely unscalable. Now, the form and reviews are automatically added to each profile when it is published. I have gone from managing 60+ forms to managing 4 across the site. Now that is a win. 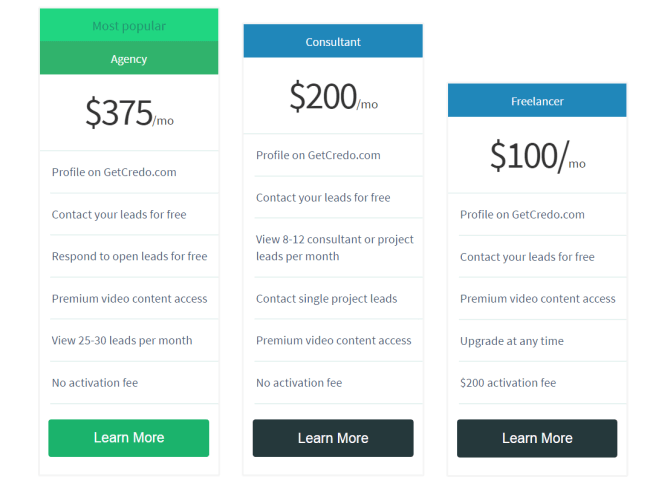 Along with this, pros can now control the types of leads they get and the types of businesses that can contact them. For example, some agencies only work in ecommerce. They can now specify this within their own form. I’ve been working on this new version for a couple of months now and have learned a lot as I’ve built it. I’m excited to continue pushing it forward, providing more value on both sides of the marketplace, and continuing to learn how to scale a bootstrapped SaaS company. Congrats on the launch – looks like a very promising platform, definitely want to take it for a spin. You’ve probably already identified it but one tweak on the client side of the signup process would be the budget – up front it just asks for the budget range, but then the final page with the pros has a filter for monthly budget. So it’s unclear for the client whether the budget is based on one-time or monthly pricing. Could be a good additional question or option for the client to say whether they want a one-time or recurring project, and then on the pros side they can say whether they want to take on one-time or recurring projects or both. Also like that the consultant pricing is not set as an hourly rate, but an overall project/monthly rate as that’s how many of us charge! Love to hear it Joe! Would love to have you on the platform. I’ve dropped the $200 Freelancer activation fee for a bit, by the way. Thanks for your feedback on the form. I’ll work that out! I am glad you like the project/monthly instead of hourly! I am a firm believer that hourly rates are not good for anyone. Though, businesses often ask about it to set their own expectations for number of hours so there is a field on each profile for it.